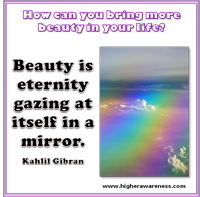 How can you bring more beauty into your life? Beauty is a portal to the soul. Surround yourself with what you consider beautiful in your workplace and in your home. If this presents problems, create just one small place - in a garden, on a mantle, a wall in a room, etc. that represents perfection to you. This is one sample of 60 Daily Smart Questions to "Open to the Divine". For more samples, see Spiritual Questions to Ask Yourself. You can also choose from 6 other themes of High Level Smart Questions and Tips.